It's a thing of beauty, is it not? 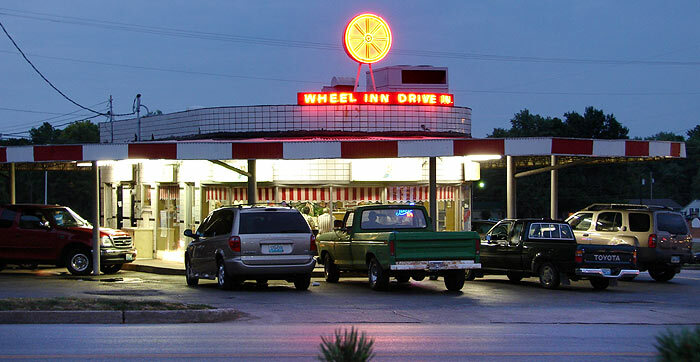 The Wheel Inn of Sedalia, Missouri is the car-hopped stuff of road-trippy dreams. 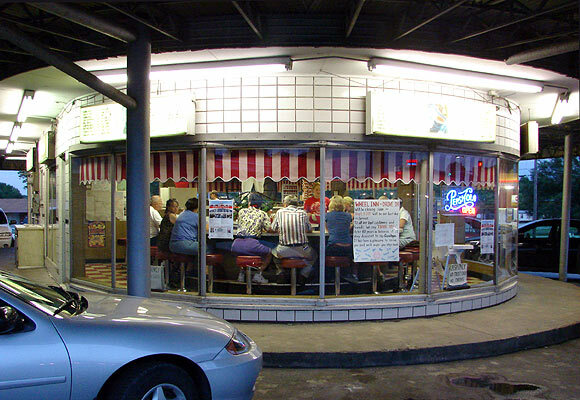 A place where lovers woo over the same local cuisine their parents woofed down while listening to that new rock-n-roll. 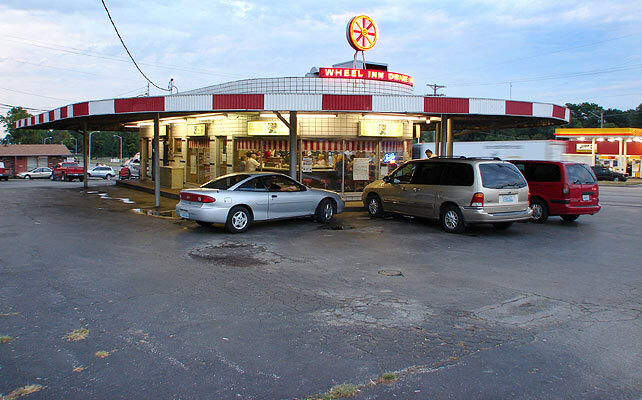 After all, the Wheel Inn has been here since 1947. 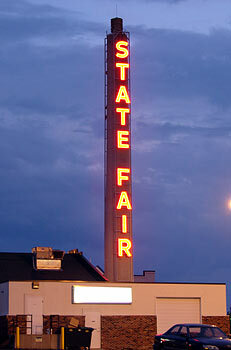 And it looks it by being genuine, without the use of fake retro decor. 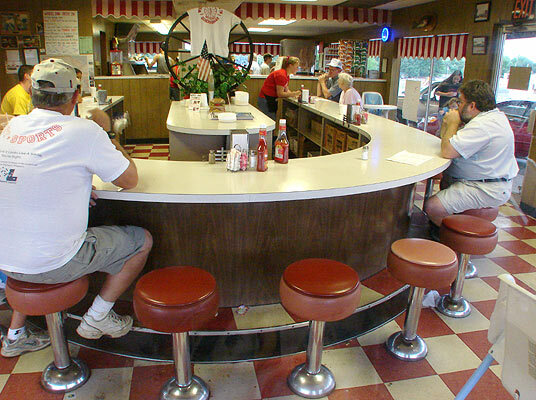 The U-shaped counter, the stools, the checkered floor...it's almost too good to be true. Alas, it won't be true much longer. 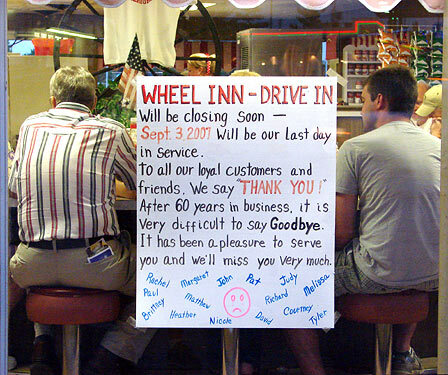 The Wheel Inn is going out of business permanently on September 3. The state of Missouri is widening the corner of busy highway 50 (W Broadway Blvd) in front of the Wheel Inn, where it intersects highway 65 (S Limit Avenue). Here's a story in the Sedalia Democrat. Apparently, trucks that serve the local big-box stores have trouble negotiating the current corner. The project will not require demolishing the building, but here's the problem: The road project will take the parking lot almost up to the back ends of these cars. There won't be enough room for cars to drive around other parked cars. This would leave parking only on the sides and back. This would not seem to me to be an insurmountable problem, but there's more. Because concrete median will be added at the intersection, the only approach would be from the side, and only with a right turn into the attrited parking lot. 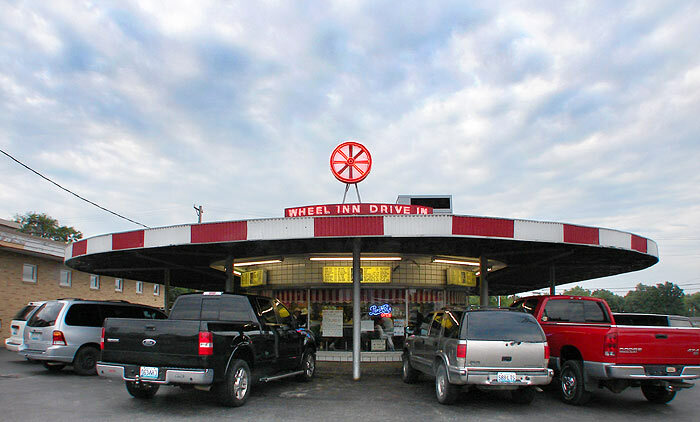 I called the Wheel Inn for clarification on their closing. I knew it was a family place when the young man who answered the phone shouted "Grandma!" when I asked to speak to the owner. 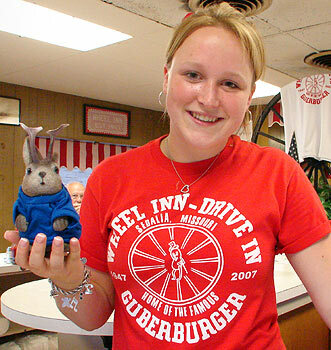 I then spoke briefly with Pat Brandkamp who, with her husband John, owns the Wheel Inn. I asked her about the possibility of staying open under these circumstances. She said "it's just not feasible." 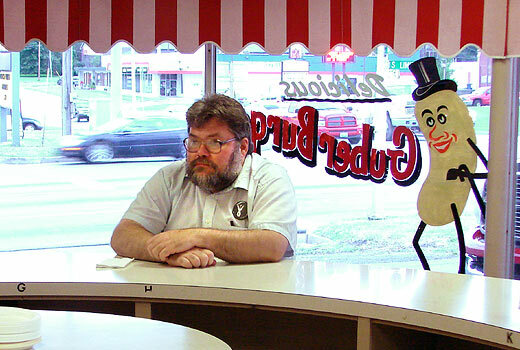 John Brandkamp retired in 2006 after working at the Wheel Inn for 46 years. 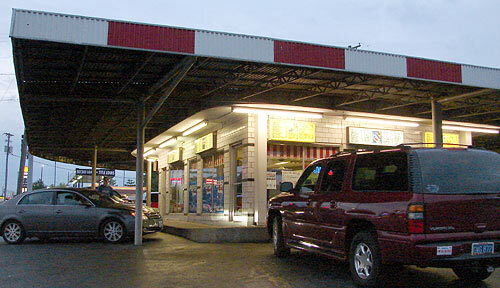 The couple have owned the business for 20 years and Mrs. Brandkamp is also of retirement age. 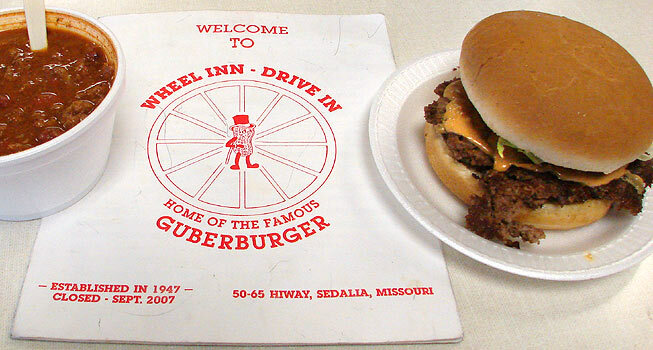 The Wheel Inn's claim to fame is the "Guber Burger" or "Guberburger", depending on whether you are looking at the sign or the menu. 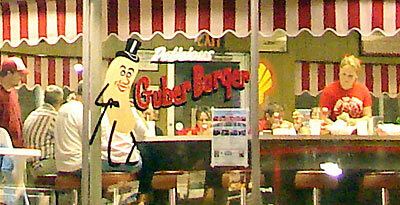 The Guberburger is a hamburger with lettuce, tomato, mayo...and peanut butter. That's the peanut butter oozing out of the edges. Here's a review at Roadfood.com. Everyone I've told about Guberburgers has said something to effect of "what?!" But I must say, it was good. 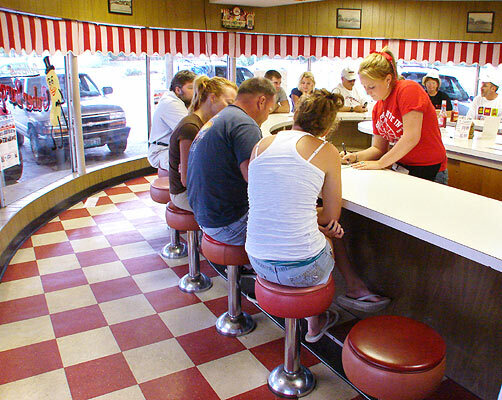 And I could tell they were the local favorite because I overheard practically every other customer ordering them. Here's another review at Serious Eats. Our server took orders for about two dozen of them during the hour we were there; the chili seemed to be a second favorite. To help the servers keep it all straight, letters are assigned to the various customer stations, though some are practically worn off. You can see G, H and K here. 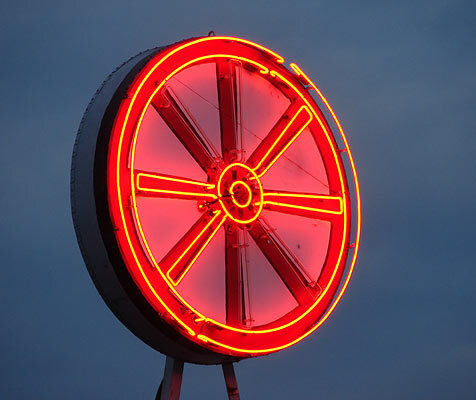 She mentioned that the owners had been offered as much as $5,000 for the neon wheel sign. There's an auction poster displayed in the restaurant, but the sign is not listed. 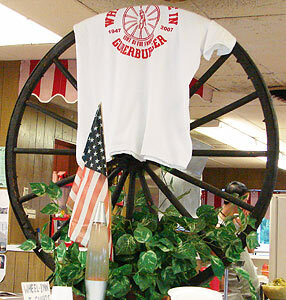 The rim of the wheel is constantly lit; the spokes chase clockwise. The fate of the building has not been announced as far as I know. 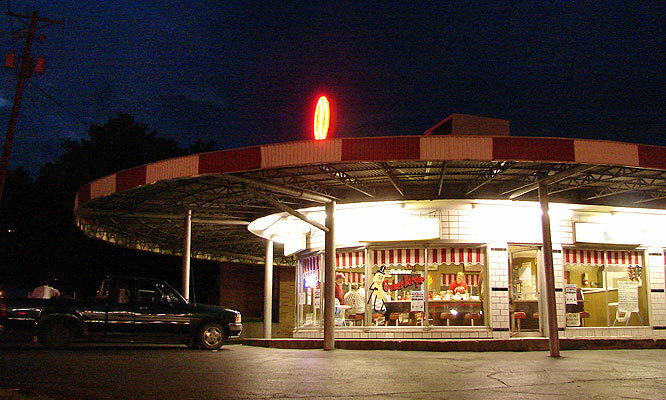 Although the Brandkamps own the business, Jack and Ruth Ann Hawkins own the building. Our server described offers she'd heard for this wheel as "insane." 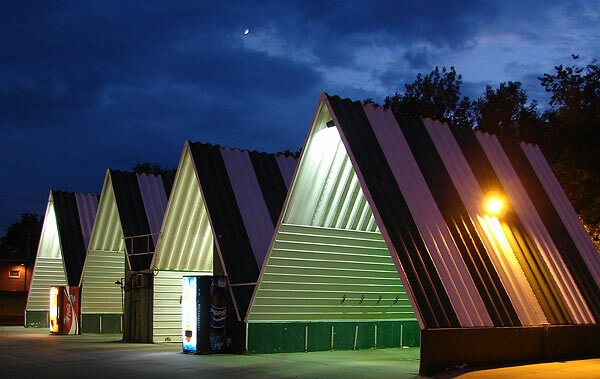 Just north of the Wheel Inn is the slightly photogenic Valley View car wash.
And if you like neon, a bit to the south of Wheel Inn is the Missouri State Fairgrounds. I've been trying to remember to shoot these marginal-quality movies on my digital camera when motion is involved in a subject. This one must have gotten on a list somewhere, as it garnered about 150 views in the 12 hours after I posted it to You Tube the other night, as opposed to the other one which got only 4 views. 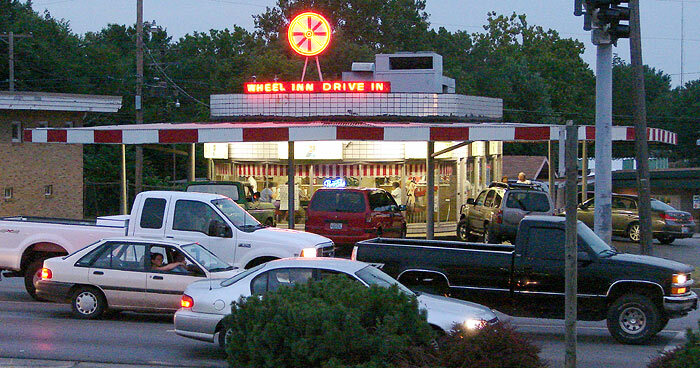 As we drove away and I saw the Wheel Inn recede in the distance, I really felt for the folks that frequent this place. Another one bites the dust for progress. You know, nobody is ever going to say "that's one heck of a beautifully wide intersection." What a damn shame! Why can't they move the road? I came over from Dudleys and have really enjoyed your site and great pictures. Good luck. Man. 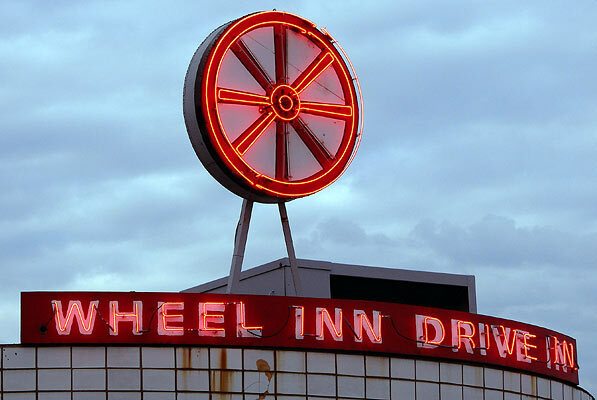 Responsible for travesties such as the Wheel Inn departing. That's why it's good to be a Topiary Cow. 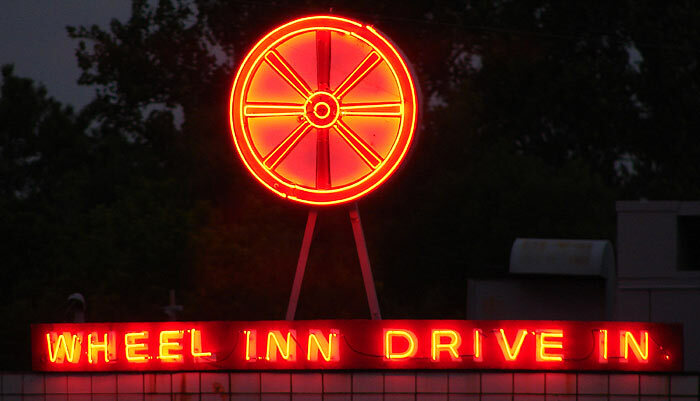 Great pictures for a trip down Wheel-Inn-Memory Lane. I am so upset that I didn't check your blog over the weekend like I normally do, because had I known about this earlier, I would have made sure to go up there and enjoy it. 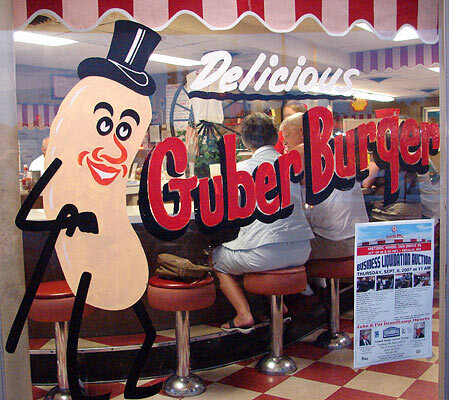 I might have eaten a GuberBurger. I'm really sorry I will never get to see the place. Thank goodness you and Ace are kind enough to documents such things.